Provides a safe protection surface - fastly assembled, inexpensive and 100% flexible. Whether for private, commercial or industrial use, the possibilities of a storage tent are diverse. For example, it could be used as a sheltered storage and working are, as a protected space for your vehicle and machines or in the agricultural sector as a barn of tent for livestock. At House Of Tents you will find small storage tents of 3x2 m to enormous halls of 10x20 m, for example. The products are available in different wall heights from 2 to 4 m. Our different product lines of storage tents are designed for year-round use and are extremely durable. All frame constructions are fully-galvanised, thus anti-corrosive. Only robust, durable PVC tarpaulin material is used that is 100% waterproof and provides high UV protection. All tents are available in so-called "Plus" models, in which the PVC tarpaulins are fire-resistant-certified. Due to being robust and durable, our storage tents are an outstanding alternative to a permanent building structure. Calculate size: Naturally, you need to first calculate how much storage space you need. Perhaps for your needs it would be practical to invest in a tent that is higher than average. A Professional or Everest storage tent offers a vast amount of vertical space, enabling goods and freight to be stacked, thus saving space. In addition, the intended location of use should be measured in all three dimensions, to ensure that there are no unexpected disruptions when setting up the tent, such as long branches or gates in the way. Selecting the tent quality: At House of Tent storage tents are available in the following quality categories: Economy, Premium, Professional and Everest. The categories differ in the quality of the tarpaulins, frame construction and stability. Our professional storage tent solutions are outstanding for year-round use. Storage tents in the Economy product line form the solid compact range. These feature a 500g/m² PVC tarpaulin and a fully-galvanised, steel frame with stable poles and connectors. The frame used in the upper range product lines - Premium, Professional and Everest is additionally equipped with a base frame and manifold roof reinforcement. The PVC tarpaulin differs in quality and weight. This ranges from robust PVC tarpaulins with a weight of 500 g/m² up to extremely resilient, moulded 720 g/m² Prime PVC tarpaulins. Storage tents in the Professional and Everest product lines feature an extremely stable, very robust frame. Depending on the model of tent, wall heights of up to 4 m are possible – the roof height is correspondingly higher. This way, even small storage spaces can be optimally used. Fast, easy use: Does a company's storage capacity need to be temporarily increased? With a storage tent this is no problem! You can create sheltered space for materials, goods or machines in no time. Whilst the construction of a permanent building must in many cases be permitted by authorities, with this tent solution you will save time and money. In general, storage tents can be set up immediately and are more cost effective than a comparable permanent building structure. Assembly can be completed in relatively little time and with few people. Should the storage space turn out to be too small, storage tents from the following product lines: Economy, Premium and Professional can be expanded by the tent size of your choice using connecting gutters. Extremely flexible and mobile: Assembling or dismantling a storage tent can be done in not time. As a result, a tent can be quickly and easily assembled in another area and stored or sold if no longer needed. The outstanding quality and great functionality of our tents assists smooth work-flow, for example at trade fairs or construction sites. In addition to temporary use, storage tents are also perfectly suited to long-term use. The quality, robust materials guarantee long-term use. Well designed constructions ensure the necessary stability and sturdiness of the storage tent all year round. A storage tent must be suitable for all weather conditions and stable. Our tents are thus made of high-quality, resilient materials and feature special ground attachment systems. The tarpaulins of our storage tents are made of stable, tear-proof PVC - comparable to a robust lorry cover. The PVC has a high level of UV resistance and is can withstand hot and cold temperatures. Seamless tent roofs and tarpaulins sit especially smooth and taut on the roof frame, reducing the amount of surface area open to wind. Special rope systems of some product lines further improve the secure attachment of the tarpaulin to the frame. From our mid range of storage tents upwards, there is a retractable supporting system of steel ropes or poles in the roof construction, parallel to the gable. This way, rainwater can run off and water cannot collect on the roof. The stable, fully-galvanised frame is responsible for the stability of the storage tent: Extra-strong poles, connector and solid ground nails made of 100% steel withstand wind and bad weather, making the tent stable. Additionally, storm protection straps can further improve the stability of the tent. Type A: The roof tarpaulin and wall section are separate. Advantage: The wall section can be individually attached or removed at intervals of 2 m. The creates numerous possibilities for entrances on the sides of the tent. Type B: The seamless roof and wall section are precisely and securely attached to the frame by a robust rope system. Advantage: The tarpaulin is perfectly positioned on the construction and a high level of stability and safety is ensured. The Economy product line, our solid compact range, is only available as Type A. The Economy storage tent is assembled with base frame or roof reinforcement and features a relatively light PVC tarpaulin with a weight of 500 g/m². Due to it being lighter and fairly simple, this storage tent is especially suitable for mobile or temporary use. Carrying bags for a comfortable transport can also be purchased at House Of Tents. The Premium product line forms our mid range of storage tents. This is also only available as Type A. Premium storage tents feature a strong, 500 g/m² PVC tarpaulin, a base frame and two-fold roof reinforcement. As a result, the storage tents are very stable, sturdy and durable. 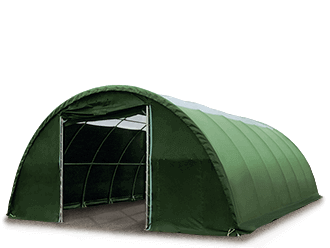 The Professional product line is part of our upper range of storage tents and in comparison to the other product lines, features an extra-strong frame. It also features two-fold roof reinforcement and a base frame, thus is extremely robust and very stable. Professional storage tents are available in both Type A and Type B models, and with wall heights from 2.0 to 4 m. Two types of PVC tarpaulin are used: Robust, 550 g/m² PVC tarpaulins, as well as extra-resilient, 720 g/m² moulded, Prime PVC tarpaulins (only available as Type B). Prime tarpaulins are 9x more tear-proof than standard PVC tarpaulins and can withstand temperatures of -30 to +50 Celsius. The Everest product line is also part of our upper range of storage tents and is only available as Type B. The Everest storage tent is extremely stable and features an extra-resilient, 720 g/m², moulded, Prime PVC tarpaulin. This is precisely secured to the frame by a stables rope system. The storage tent’s tarpaulin is fire-resistant-certified. 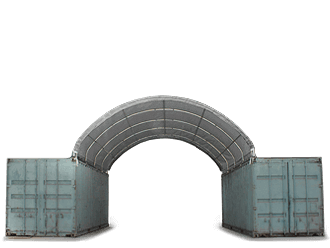 On each gable wall, the storage tent has large entrance gates, which - depending on the size of the tent - can be opened using a cable or zips. From a tent width of 6 m, practical pedestrian entrances are additionally available, which can also be opened and closed with zips. In addition to our storage tent product lines, we also provide custom-designed storage tents. Simply contact us with you requirements. In many cases, we can deliver the first construction drawings within a few days. 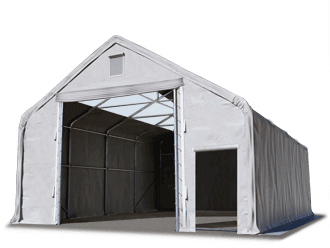 Once these have been approved by you, production of your custom storage tent commences and depending on the size of the project, will be available in approximately 6-8 weeks. You can effortlessly improve the stability of your storage tent. House Of Tents provides special accessories for this. The Storm Safety Set comprise robust tension belts and ground attachments. Depending on the surface, professional ground nails or professional concrete anchors can be selected. The Safety Plus Package ensure a high level of stability. As part of the Safety Plus Package, storage tents in the Professional quality category even come with statics. These were certified by German engineers. In the case of storage tents with statics, we guarantee that the tent can withstand certain gale forces or force effects - the exact values can be found in the product descriptions under the “statics” section. For this, the entire tent construction is additionally stabilised and secured using a specially designed steel rope system, a ground attachment system and reinforced tension belts with ratchet tensioners. Depending on the surface, professional ground nails or professional concrete anchors can be selected to secure the tent. The other quality categories do not come with guaranteed statics as part of the Safety Plus Package. However, the Safety Plus Package can increase stability and wind resistance for these tents. 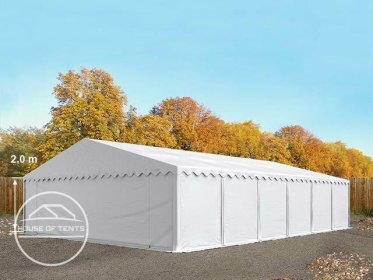 At House Of Tents fire-resistant-certified PVC storage tents are available in every product line, for example, according to the following European standards: GB-EN 13501-1 or CH-BKZ 5.2. This guarantees the highest level of security and complies with the fire safety regulations required for public events. This may also be of great importance for insurance purposes. Few of our competitors provide certification of this kind. Our fire-resistant tents can be identified by the logo, showing a crossed out flame. If your storage tent becomes damaged, it is important to repair this promptly. As, only an intact tent is stable and secure. House Of Tents can provide replacement part 10 years from the date of purchase for many products. We have approximately 55,000 replacement parts in stock. From roof tarpaulins to frame components, many replacement parts can be requested. We will gladly advise you regarding repairs. Smaller repairs to tarpaulins can be carried out by the customer using our repair sets. The repair set is equipped with a variety of tools. Should you discover a tear in the tarpaulin, you can repair this with a special PVC adhesive and the corresponding g PVC patch. An eyelet repair set can be used in the case of torn-out eyelets. Using the hammer provided, damaged eyelets can be replaced in the tarpaulin with new ones. Benefit from our many years of experience in the storage tent sector, our outstanding service and special after sales support services. At House Of Tents you will receive numerous guarantees For example, an anti-corrosion guarantee or extended guarantee on closed, correctly assembled PVC tarpaulins. As for the guarantees for your product. Unique: We provide replacement parts for 10 year from the date of purchase for the majority of our products.